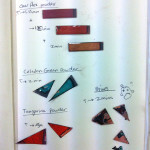 This workshop took us though different process with liquid and powdered enamel. 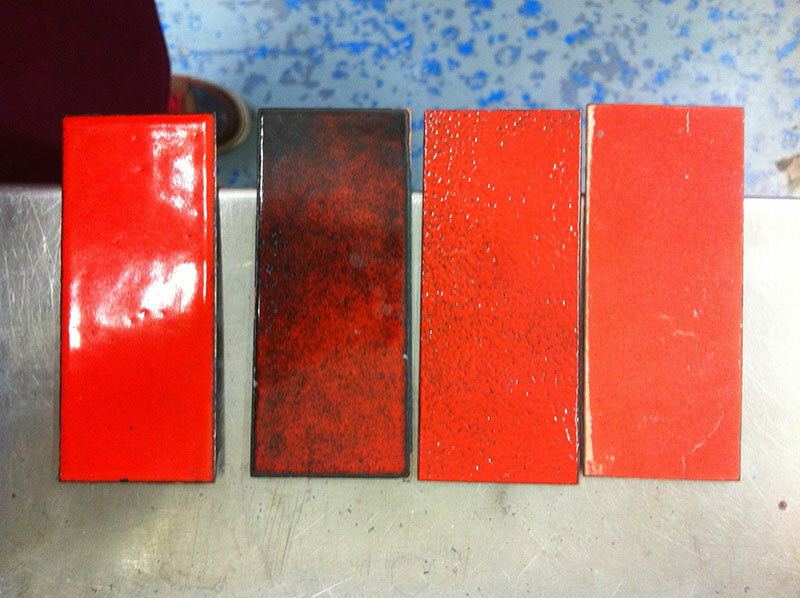 We had the chance to experiment with liquid and powder enamel on both copper and steel. Gloves goggles and a fork must be worn at all times when placing or removing objects from the kiln. Copper: Degrease the object and paint with liquid process enamel and leaving to dry completely or using the ventilation unit powder the enamel by laying down a sheet of paper (to catch the and reuse the waste), placing the copper on a block for ease of picking it up afterwards and use the a hand sieve to evenly dust the surface. It is helpful to enamel both sides to prevent bowing, this can be done with a layer of dry liquid enamel on the underside fired at the same time. While the copper is still hot from the kiln it is possible to flatten it. Any bare areas will need to be scribed to have the fire scale removed. 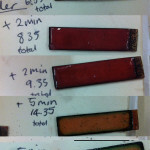 The below images show the effect of different firing times on different powdered enamels including a clear enamel which in total was fired for almost 20 minutes causing oxidation to form around the edges of the clear enamel. The attempts at firing different enamel colors on the same plate at the same time completely failed causing the enamel to blob together and lake off. The Celadon green fired faster than the tangerine. The clear was on thicker copper and took longer to fire again. 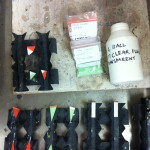 The below image shows from right to left different firing times… under fired matt, under fired specked, completely fired, double coat. Steel: Steel first needs a tooth ground into its surface so we sand blasted our steel plates although I am sure a course wet & dry paper would have functioned provided it doesn’t’ cause to much oxidation. Then we painted and fired the plates with a base coat of Vitreous Enamel which protects the carbon in the steel producing CO2 causing unwanted reactions the enamel. Once the steel is sealed in a layer of Vitreous enamel the process is the same as for copper. This entry was posted in Enamel.